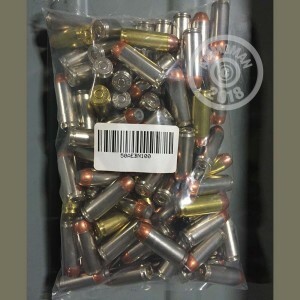 If keeping your Desert Eagle or other .50 AE firearm is getting a little costly for your liking, try this mixed lot of 100 rounds. These cartridges are great for inexpensive target shooting; they're in good condition but come from retail boxes that had damaged packaging. These cartridges use non-corrosive Boxer primers and brass cases or nickel-plated brass cases. Bullet types may vary as well and may include hollow and soft points as well as full metal jackets. Ballistics may vary somewhat as well. Whether you shoot an inexpensive or an expensive caliber, you'll reap some great savings from AmmoMan.com. Simply place an order for $99 or more to get free shipping!